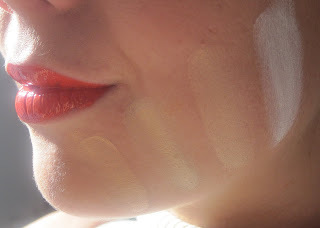 In response to some recent requests, I have done a quick swatch of the lighter foundations colours. 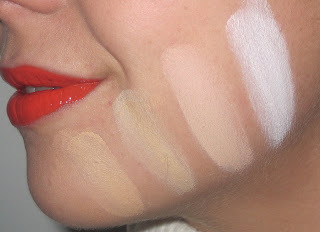 To give some perspective, I am a 210 in Cream Foundation. I am also wearing Intense Lipgloss in ‘Drag’ – a lovely tangerine. From left to right: CF140, CF135, CF120, CF110. Above without flash, below with flash. I’m off on holiday tomorrow, so Lindsay will be taking over the blog posts next week!